Jan is meeting her knitting group for their yearly holiday knitting and gift exchange party, so no fancy Sunday dinner this week. Eilene is off to have dinner with friends, so it is just Jan and I for dinner tonight. Jan has requested beef stew because it makes such good leftover for weekday lunches. We went back and forth about how it should be spiced and Indian and cinnamon were not what she was craving. She wanted something southern European. I have most of a bottle of ruby port left over from Thanksgiving. A search for “port beef stew” led me to many recipes, but most of them were too complicated for my taste. If there are too many ingredients in the pot, it is not possible for any one ingredient to shine through. Other recipes I found simply did not appeal to me for one reason or another. For the ingredients, I started with his recipe and added and subtracted until it matched with what was developing in my head. For my family, if it does not have garlic in it, it is not a stew. One of the recipes that I had glanced at used dried porcini mushrooms, but had ground them to a powder. This seemed like a useful technique. I also wanted to add potatoes, but I wanted them to cook in the stew, not into the stew. To accomplish this, I used baby potatoes and left the skins on. Instead of adding two onions at the beginning, I decided to add pearl onions later when I added the carrots. I especially liked Dirk’s port wine reduction at the beginning of the cooking process. This seemed like a good way of developing the mushroom’s deep, beefy umami flavors, first in the pieces of meat and then dispersing them evenly into the stew. However, the idea of browning the carrots and then cooking them again during the port wine reduction and then a third time during the slow cook, seemed like a recipe for disaster. I really do not like overcooked carrots. 1. Add the one tablespoon of olive oil to a 6 quart Dutch oven and brown the beef chunks well, in batches, over medium high heat. Remove to a plate as the pieces are done. Tip: It is not necessary to brown every side of the beef, just a side or two. 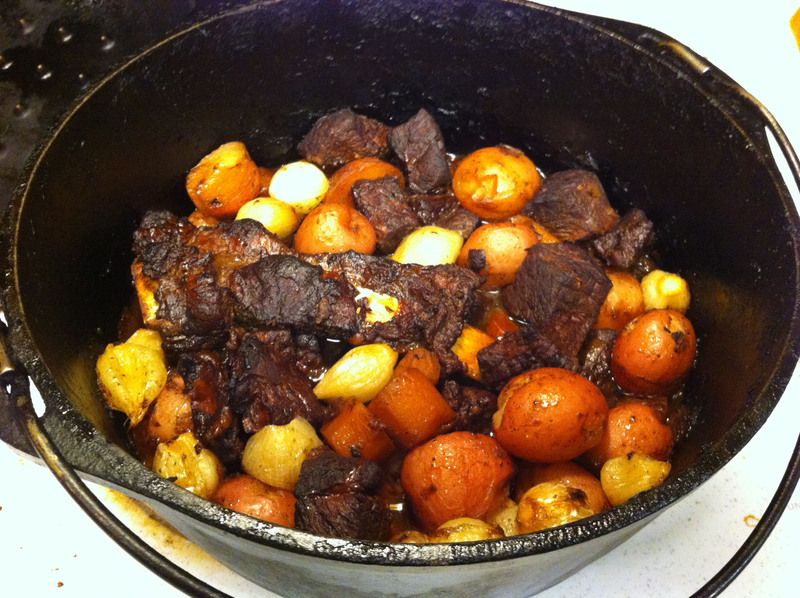 The beef bits that stick out of the liquid in the pot will continue to brown while the stew is cooking. Many recipes call for you to salt and pepper the meat before browning. I am on a low salt diet so I reduce salt where I can. Black pepper on the other hand turns bitter if burned. I usually add it with the liquids or just before the dish is done to retain its flavors. 2. Cut the big chunks of meat off the bone and brown the pieces and bone. Remove them to the plate. Tip: The rib bone’s cartilage adds gelatin to the stew, which is what gives it that rich mouth feel. Cook’s Illustrated suggests stirring in a half teaspoon of dissolved Knox gelatin at the last minute instead of using a bone. I personally prefer bone in. You could also add one bone for each of your guests, so everyone gets to share. 3. Without cleaning the pot, put the second tablespoon of olive oil in the Dutch oven and add the onions with a pinch of salt. Brown the onion well, about 8 to 10 minutes. Tip: The salt draws the moisture out of the onions and allows them to brown more quickly. 4. Pull the onions to the side of the pot and add the sliced garlic to the hole in the center. Sauté for one minute and then mix them into the onions. 5. Stir in the porcini mushrooms and pepper and then add the port wine. Tip: Put the dried mushrooms in a spice grinder and process them to a powder. 6. Turn on the oven to 350° F.
7. Return the beef to the pot and continue cooking, uncovered, over medium high heat. Stirring occasionally, cook until most of the port has reduced, 15 to 20 minutes. Tip: You want the meat pieces well coated in the sauce, but you do not want the reduction at the bottom of the pot to burn. Scrape the bottom well when stirring. It is also easiest to remove the bone while you stir the pot and then to nestle it back in to the meat and onions. 8. Add the wine and scrape the bottom of the pot well. Bring the pot to a boil. 9. Place a sheet of aluminum foil over the pot and seal the lid on tightly. Tip: The foil acts as a seal to make the Dutch oven act more like a pressure cooker. You lose less of the cooking liquid to evaporation and the meat comes out more tenderly. 10. Put the Dutch oven in the oven and cook for 1 hour. Tip: You can do the stew on the stove top, but I prefer to use the oven. You get all around heat and less chance of scorching the bottom of the pot. 11. Remove the pot from the oven and gently stir in the potatoes. Reseal the pot and return it to the oven for 30 minutes. Tip: My idea here is that you do not stir the pot much after you add the vegetables. You want them cooked in the sauce, but not breaking up and thickening the sauce. 12. Remove the pot from the oven and gently stir in the carrots and pearl onions. Reseal the pot and return it to the oven for 30 minutes. Tip: You may use frozen pearl onions, but I prefer fresh. Note: One problem I have had with peeling pearl onions is removing too many layers, because the dry thin paper outer layer sticks to the next layer. Solution: Put the onions in a bowl and pour hot water over them for 30 seconds to soften the outermost layer. The softened outer layer easily peels off. 13. Garnish with parsley and serve from the Dutch oven.